I know I am somewhat unfair, but I cannot get enough of this dramatic combination. In addition, En carne propia is probably one of the songs that many international dancers will dance to and leave the floor saying ”Now, that last song was really romantic, wasn’t it?”…….. There are a lot of tango lyrics about broken hearts, longing and grief, and in relation to all of that, remorse and self-reflection. The following tango, however, is about a situation that comes from the same source, but this time the message is full of anger, grudge and hatred, like Te Odio (translation coming soon). The title is very beautiful, but at the same time also an expression that cannot be translated so easily. Literally, it would mean ‘In own flesh’. So, as far as this song is concerned, if you feel something en carne propia, it is like a strong feeling that comes back at you in revenge and subsequently crushes you. Just listen to this tango and you will understand what the title means. *This metaphor sounds a bit weird to me, but I am sure you get the meaning anyway. That’s an interesting view and may be true for example for ‘Te odio y te quiero”.Well, at the end of Te Odio the ‘protagonist’ wishes his former girlfriend/wive/whatever an ‘eternal and fatal curse’. I’ve finally read all the posts and listened to all the recordings. 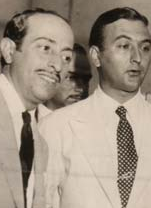 I enjoy your stories and share your love for Di Sarli and D’Arienzo. Thanks for including the original lyrics in the last post; I hope you continue doing so. I hope at some point that you’ll use categories for composer, orchestras, and singers so all will be indexed for reference. I just started reading today since I forgot to check weekly when you began. Adding FOLLOW BLOG BY EMAIL automatically sends a post to your subscribers. I’ll be one of the first to subscribe when you add that capability. I want to understand more of the lyrics. Your blog is my personal tango appreciation course. Thanks for loving tango so much to share it. Thanks for your comment. I am glad my translations are useful to you and help you to understand tango culture better, which is, of course, my mission. As I was designing this blog, I did not immediately start organizing categories because I felt I was not likely to produce a lot of content on the short term (and a lot of content means you are going to need a clear overview). However, now that the blog has become a bit succesful, I will think of a better way to organize everything. I was indeed thinking of orchestras first. I will also take your suggestion about a follow blog option into account. Anyway, Jan, I appreciate the link you put on your own blog, that way I am surely going to receive more visitors. Un abrazo.